WASHINGTON (CNN) -- Seventeen Republicans joined Democrats on Friday in passing a two-sentence resolution denouncing President Bush's plan to boost troop levels in Iraq. The resolution passed easily, 246-182. Democrats hailed the victory, while outside the chamber, Republican congressional leadership blasted the resolution, calling it the first step toward de-funding the war. The resolution says that Congress supports the military but disapproves of Bush's plan to send 21,500 additional troops to Iraq. A clear majority of Republicans battled to the end against the resolution. "One vision sees no hope for us in Iraq and counsels that we withdraw, just give up," said Ileana Ros-Lehtinen of Florida, the ranking Republican on the Foreign Affairs Committee. "By contrast, the other vision focuses on success." The Democratic leadership has said it will not cut funds for troops already in Iraq, but Sen. John Murtha, chairman of the committee in charge of the Defense Department's purse strings, has already signaled he may attempt to tie future deployments to legislation requiring the troops be fully equipped and armored before they're allowed to be shipped out. Republicans say that's not necessary. "What we have now is a system where you can move personnel very quickly; they marry up with the equipment in places like Kuwait and they move into the battle," said Rep. Duncan Hunter of California, the ranking Republican on the House Armed Services Committee. "So our ability to move people quickly and move equipment quickly to the fight to save American lives and American interests will very much be compromised by any of these micromanaging policies. "Micromanaging DoD personnel policies and trying to choke off equipment and people for the war-fighting theater is extremely dangerous," Hunter said. The White House acknowledged the resolution's passage, noting in a statement from Press Secretary Tony Snow's office that the president's plan "enjoys the support of the Iraqi government and U.S. military leadership, including Gen. David Petraeus, commander of the Multi-National Force in Iraq, who recently was confirmed to his post by an 81-0 vote in the Senate." "The resolution is nonbinding. Soon, Congress will have the opportunity to show its support for the troops in Iraq by funding the supplemental appropriations request the president has submitted, and which our men and women in combat are counting on," the statement said. "The president believes that the Congress should provide the full funding and flexibility our armed forces need to succeed in their mission to protect our country." Now that the House has completed its debate, the showdown moves to the Senate, where Senate Majority Leader Harry Reid of Nevada has promised to bring up the same resolution Saturday. Reid urged Senate Republicans to drop procedural moves that blocked votes on similar Senate resolutions last week. "We demand an up-or-down vote," Reid said Thursday. "The resolution says we support the troops and oppose the escalation of the presence in Iraq. We're determined to give our troops and the American people the debate they deserve." But it was not clear whether Reid and his allies will get the 60 votes needed for the Senate to cut off debate on other matters and bring up the issue. Minority Leader Mitch McConnell of Kentucky said Republicans will insist on "a measure of fairness" that will allow them to offer alternative resolutions, including one stating the Senate won't cut off money for troops in the field. "If we have only one alternative, it will involve a vote on funding the troops," said McConnell. He predicted enough Republicans would stick with him to prevent the House resolution from coming to the floor. On February 5, all but two Republican senators voted to block debate on another non-binding resolution backed by most Democrats and several Republicans that would have expressed the Senate's opposition to deploying additional troops. Republicans said Reid's latest move appears to leave behind that measure, backed by Virginia Republican John Warner, the influential former chairman of the Senate Armed Services Committee, and current Armed Services Committee Chairman Carl Levin, a Democrat from Michigan. Published polls indicate a solid majority of the U.S. public opposes the Bush plan, and Democrats said the November election victories that put them in control of Congress show Americans want to wind down the nearly four-year-old war. 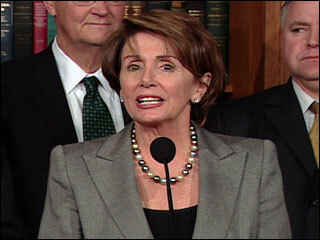 House Speaker Nancy Pelosi addresses the House floor on Friday.